My back issues began over 34 years ago, in 1983. I was given epidural injections. When I reached the point where I was unable to sit down, I had my first back surgery, a laminectomy on L4/L5, L5/S1. After the surgery, I used a walker for many years. In 2009, I had a second back surgery, a fusion at L4/L5, L5/S1. My third and fourth back surgeries In 2013 and 2016 involved removal of previous hardware, and fusion of L1-S1. Besides walkers, canes, and mobility scooters, I also had a service dog with a harness that I used for balance and support. Over the years I have worn a number of braces including two substantial back braces and braces for both legs. My back issues had resulted in burning in both calves and feet, and bursitis in both hips with pain extending down my right leg. I have had numerous tries of Physical Therapy, the most successful being Aquatic Physical Therapy in a warm water pool. Since my last surgery I have seen three Physiatrists and two Internists, one with an Anesthesiology specialty, in my search to heal my back, resolve severe pain, increase my functionality, and be able to stop wearing the brace I had worn for over ten months following the last surgery. 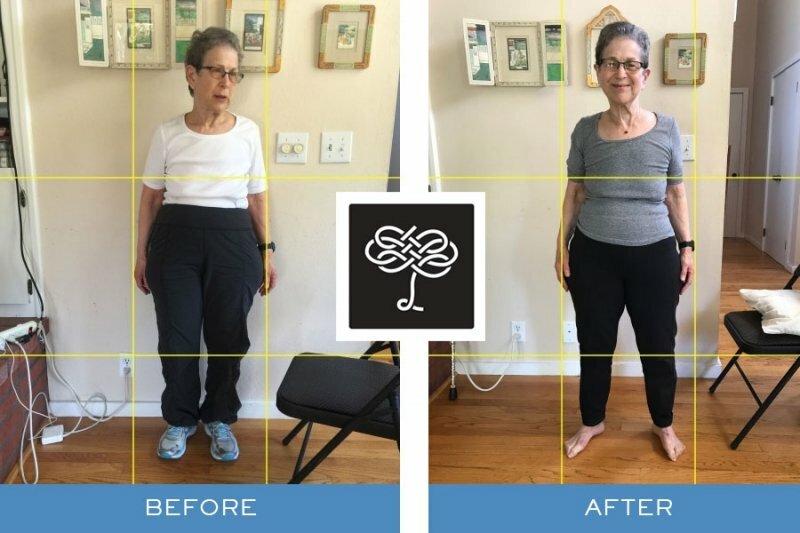 With my history, I wasn’t sure that the Gokhale Method® was going to be able to help. I attended the Free Workshop, and then had a consultation with Esther Gokhale. I found her extremely knowledgeable, and able to immediately offer help for my situation. She taught me how to engage and develop my Inner Corset. I then started the Foundations Course individually with Monisha White. After the first session with Monisha I was able to discontinue use of my back brace and haven’t needed it since. 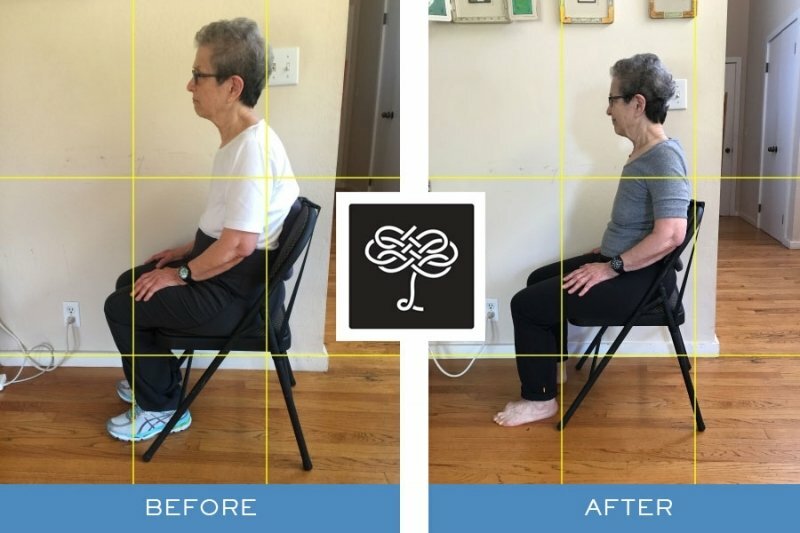 With Monisha’s help I was able to continually improve my posture, with Stretchsitting (I love shoulder rolls), Stacksitting, Tallstanding, Stretchlying (side and back), Glidewalking, Hip-Hinging, and wonderful Kidney-bean shaped feet. Because my back was very stiff and painful, lying down and going to bed had been extremely difficult activities. Once I learned Stretchlying, lying in bed was very comfortable, and I looked forward to getting into bed. Having spent years as a teacher and in helping professions, it is always wonderful to find others who are passionate about their subject matter and able to teach in a way that enables others to absorb the information and apply it in their lives. This has been my experience with the Gokhale Method®. Demonstration, visuals, positioning my body, review, practice, and homework involving reading and exercises continually reinforced the information. 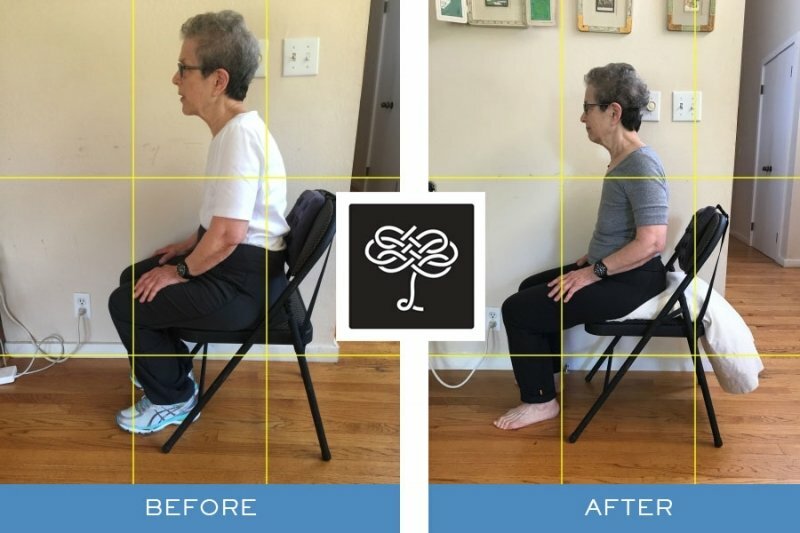 I own the Gokhale Pain Free™ Chair and two Stretchsit® Cushions (one permanently in my car, and the other for use on chairs at home or other places), and these help me sit comfortably. With the conclusion of the six session Foundations Course, I am engaging in continuation of the learning. It is important to me to build on current knowledge, to continually practice, stay engaged with others on this journey and learn new information. I am a senior with years of having a compromised back. I was amazed that in a short time with the Gokhale Method I was able to make significant changes to enhance the quality of my life. I am hopeful that others will learn this information and avoid the many years of suffering that characterized my life. I am very appreciative of Esther Gokhale’s work, and grateful for the many methods she has developed to help others. Notice how much stronger and more confident Abigayil appears while standing, after! Next Post: Sitting: Is It Hurting You? Wow, this is so inspirational! Thank you for sharing it. I have sent a link to a friend of mine who has very serious back issues similar to Ms. Tamara's. I am grateful to Ms. Tamara for allowing the photos to be shared. Thanks to both of you! I will share this blog post every time I find someone in serious pain. Thanks! Yes, it was very generous of Abigayil to share her story including her name and photos. She shares our passion to help people. When people who have been through as much as she has, they sometimes lose hope - her story gives hope. And you are now helping spread that hope - thank you again! Fantastic work of both sides - teachers and student! For sure the improvement of the wellness from Ms. Tamara is just started! 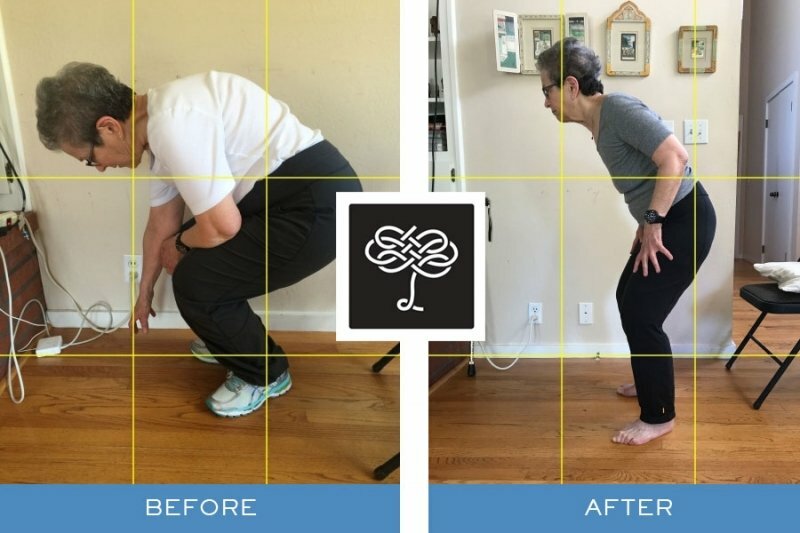 the new techniques are part of everyday life, so people are exercising and healing all day (and night) long after they've learned the basics. with reduction in pain, improved sleep, and various other enhancements in quality of life, people usually get more active - this gives an additional boost to the system and less of a dependence on interventions, including ours.